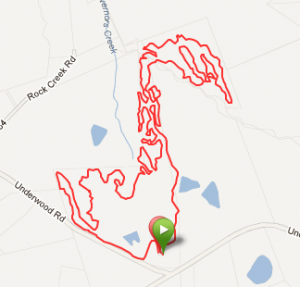 Late this evening a friend and I decided to go and run Governor’s Creek, a local Mountain Bike Trail. We had a good time and just cruised along. The run was uneventful except for the one spill he had. This time out was the shortest run I have done out there. Somehow it seems that i always run a different way…EVERY TIME! Don’t quite understand it but always makes for an adventure. Anyhow, 4.27 Miles in 50:10. No speed records being broken but a good time.